The NCCRC turned 10 in 2013! Read about our history. At some point, everyone has heard something like this on TV: "You have a right to a lawyer. If you cannot afford one, one will be provided to you." In 1963, in the celebrated case of Gideon v. Wainwright, the Supreme Court said that individuals charged with serious crimes have a right to counsel. The Court later expanded the right to juveniles charged with delinquency offenses and people charged with misdemeanors. Fewer than half the states guarantee counsel for those being jailed for failing to pay child support or a criminal fee/fine. This has contributed to the ever-growing justice gap and actually worsened the indigent defense crisis. In fact, the United States now lags far behind the rest of the world when it comes to the right to counsel in civil cases. Read more about the history of civil right to counsel. Having a lawyer can make the difference between keeping a home or losing it, obtaining protection from domestic violence or risking injury, having sufficient food or going hungry, or even keeping a family together versus having it split apart. But the ultimate consequences of losing these types of civil cases extend beyond these immediate effects. When people lose their homes or children, or experience domestic violence that they cannot stop, they often have problems with school and employment, experience psychological problems, and are forced to use publicly-financed medical care, shelter and benefits systems. Thus, not only does losing the case affect them in multiple ways, but all of society bears the cost in a way that is significantly more expensive than paying for counsel in the first place. Moreover, families of color, families headed by women, children and the elderly suffer these consequences disproportionately. Most low-income people facing serious civil legal problems in America cannot afford legal representation. And the legal aid programs are chronically understaffed and can meet only a small percentage of the need; about 80% of the legal needs go unmet. 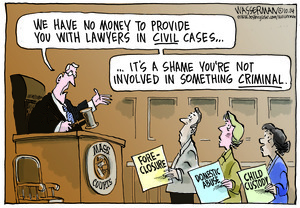 And while pro bono services from the private bar have grown in recent decades, they cannot begin to fill the void. Additionally, there is growing evidence that providing counsel not only makes outcomes more accurate, but may actually help the states save money. The right to counsel can also be an excellent tool for fighting poverty. Judges have also written about why there should be a right to counsel. The National Coalition for a Civil Right to Counsel (NCCRC), organized and funded in part by the Public Justice Center, is an association of individuals and organizations committed to ensuring meaningful access to the courts for all. Founded in 2003, our mission is to encourage, support, and coordinate advocacy to expand recognition and implementation of a right to counsel for low-income people in civil cases that involve basic human needs such as shelter, safety, sustenance, health, and child custody. At present, the NCCRC has nearly 300 participants in 39 states (see our interactive map's "NCCRC Presence" view to see where they are), all of whom are committed to exploring how the right to counsel in civil cases can best be advanced in their particular jurisdiction. Read more about the NCCRC, and check out some of our major work.